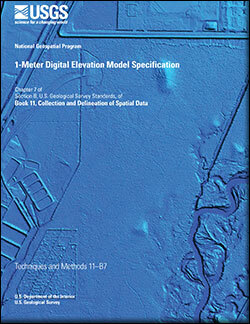 Standards and specifications are essential to facilitate the development and sharing of geospatial data and products. 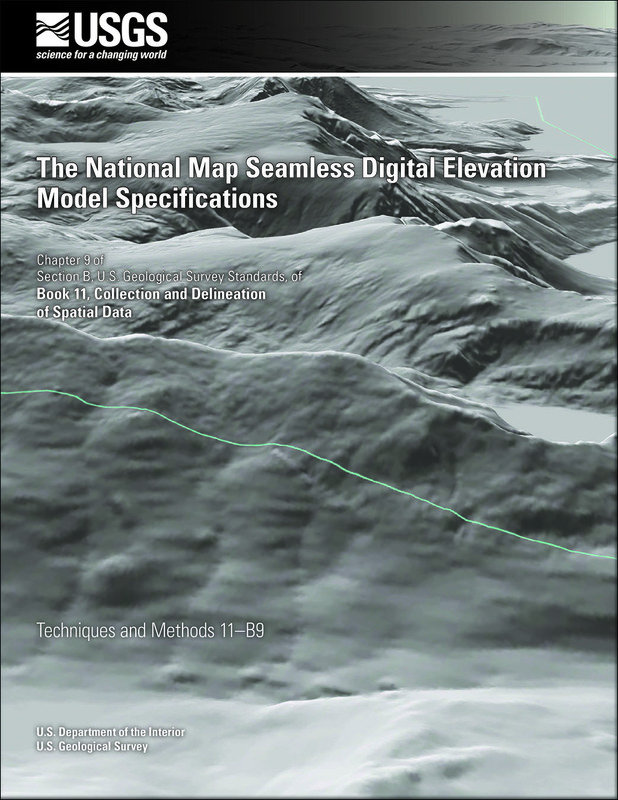 National Geospatial Program (NGP) standards and specifications define requirements to ensure that all maps and data prepared by NGP, in support of The National Map, are consistent in accuracy, structure, format, style, and content. Standards and Specifications – What Exactly Are They? For comments or questions about any USGS National Geospatial Program standards and specifications, please e-mail tnm_help@usgs.gov. 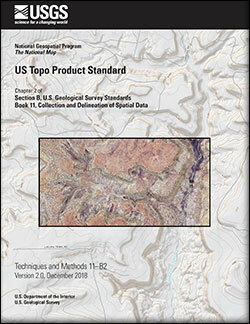 Davis, Larry R.; Fishburn, Kristin A.; Lestinsky, Helmut; Moore, Laurence R.; Walter, Jennifer L.
Davis, L.R., Fishburn, K.A., Lestinsky, Helmut, Moore, L.R., and Walter, J.L., 2019, US Topo Product Standard (ver. 2.0, February 2019): U.S. Geological Survey Techniques and Methods book 11, chap. B2, 20 p., 3 plates, scales 1:24,000, 1:25,000, and 1:20,000, https://doi.org/10.3133/tm11b2. Archuleta, Christy-Ann M.; Constance, Eric W.; Arundel, Samantha T.; Lowe, Amanda J.; Mantey, Kimberly S.; Phillips, Lori A.
Archuleta, C.M., Constance, E.W., Arundel, S.T., Lowe, A.J., Mantey, K.S., and Phillips, L.A., 2017, The National Map seamless digital elevation model specifications: U.S. Geological Survey Techniques and Methods, book 11, chap. B9, 39 p., https://doi.org/10.3133/tm11B9. Arundel, Samantha T.; Archuleta, Christy-Ann M.; Phillips, Lori A.; Roche, Brittany L.; Constance, Eric W.
Arundel, S.T., Archuleta, C.M., Phillips, L.A., Roche, B.L., and Constance, E.W., 2015, 1-meter digital elevation model specification: U.S. Geological Survey Techniques and Methods, book 11, chap. B7, 25 p. with appendixes, http://dx.doi.org/10.3133/tm11B7.